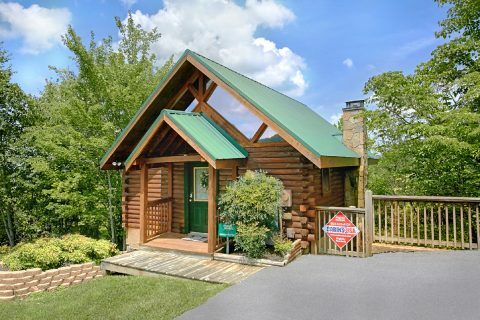 Experience "Angels Ridge" in the action-packed Smoky Mountains of Tennessee near Pigeon Forge. 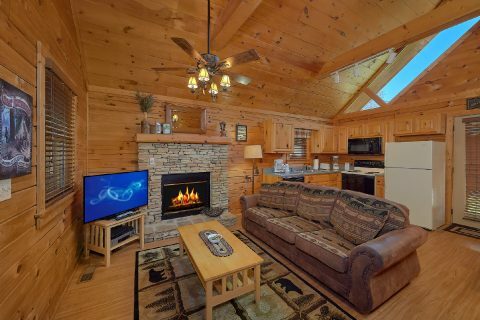 Located only a few minutes from the heart of downtown, this romantic log cabin opens up a world of possibilities for your vacation. With dozens of attractions, shops, and restaurants will within reach, you'll have no trouble finding things to do in the Smokies. 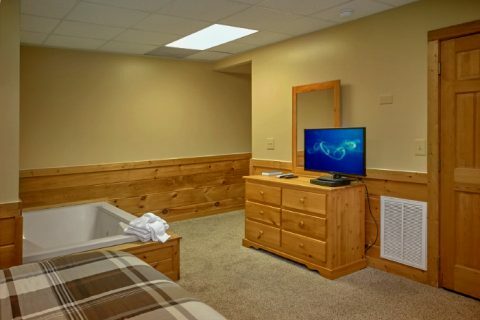 Better yet, when you aren't exploring fun attractions in Pigeon Forge or taking an exhilarating hike in the national park, you can be relaxing in your authentic Smoky Mountain cabin in Arrowhead Resort. 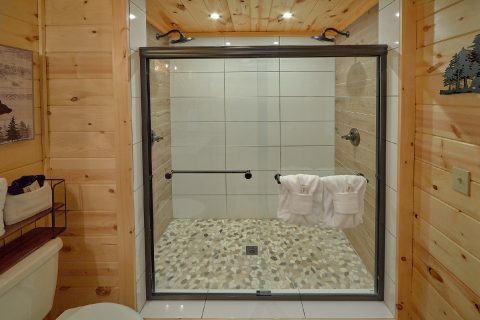 Not only does this vacation cabin rental come with pool access, but it also features luxurious amenities and furnishings. 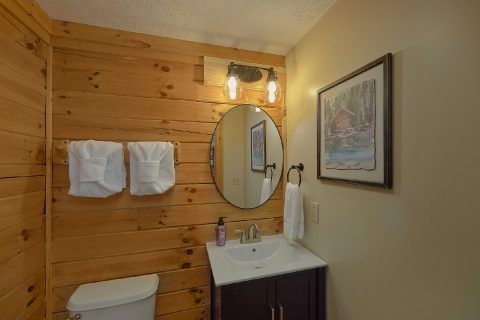 Step into the main level of your 1 bedroom Arrowhead cabin rental, and you'll find an inviting space to host your Smoky Mountain getaway. The main living area is an open floor plan with a kitchen, dining space, and den. Rounding out this space is a stacked-stone, electric fireplace that makes this level warm and welcoming. 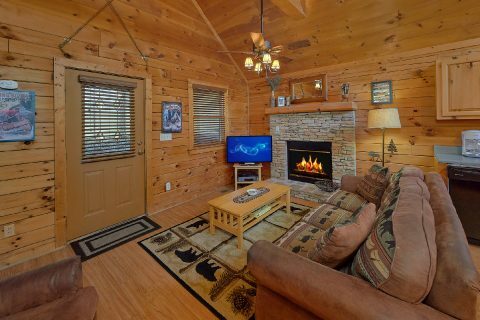 In the living area, you can unwind with a movie by the fire. 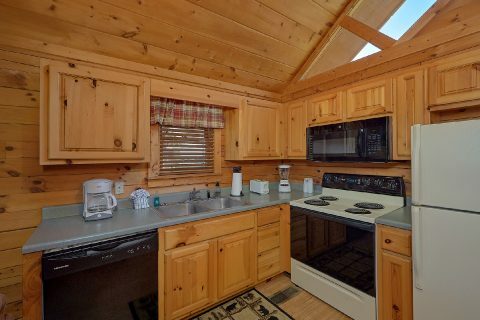 For delicious dinners, make use of your cabin's fully equipped kitchen and charcoal grill. 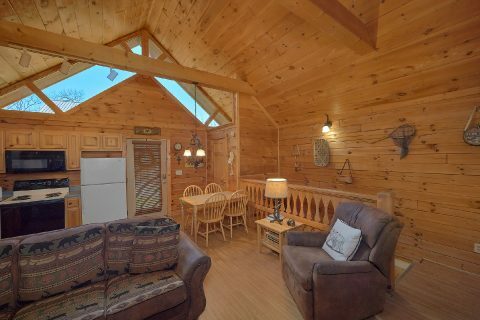 In the evening, sit out on your cabin's deck to listen to the sounds of chirping crickets while relaxing in rocking chairs, sitting on the porch swing, or taking a dip in the warm waters of your covered hot tub. "Angels Ridge" is also very convenient for reaching the resort pool, so you can stroll down for an evening swim on a warm summer night. 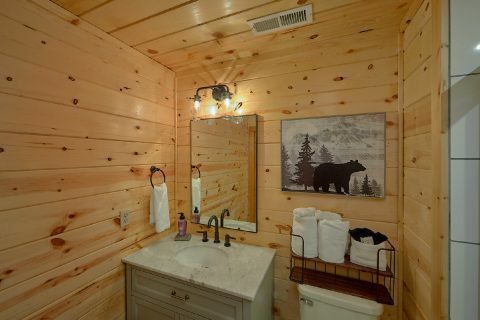 Other features that come in your 1 bedroom honeymoon cabin are a washer and dryer so you can pack light for your vacation. 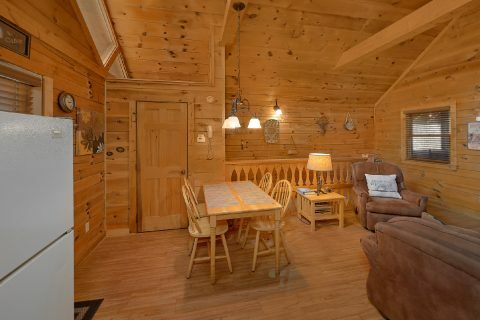 Additionally, this rustic rental offers WiFi access so you can share your vacation memories with friends and family back home! 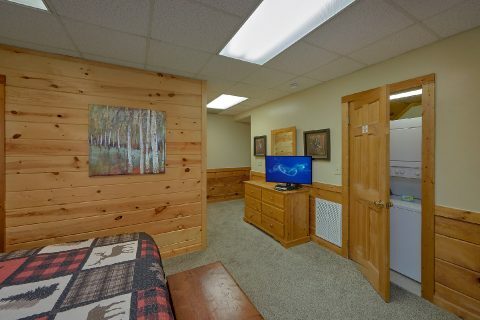 Downstairs, you'll find your cabin's main bedroom suite. 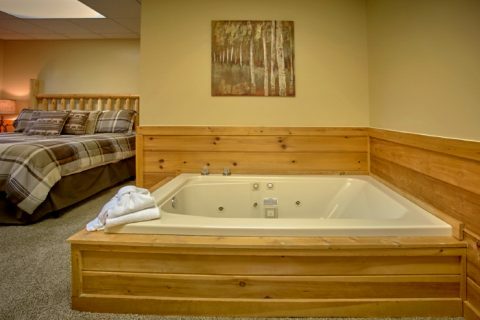 This space comes complete with a king-sized bed, television, private bath, and a romantic in-room jacuzzi tub. 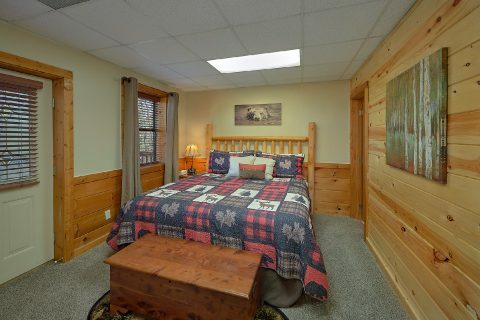 With your comfortable 1 bedroom cabin retreat, you and your sweetie will wake refreshed for another day of fun, romance, and excitement in the Smoky Mountains of Tennessee! Don't forget to book your romantic Smoky Mountain cabin that sleeps 2 guests online for a special discount! 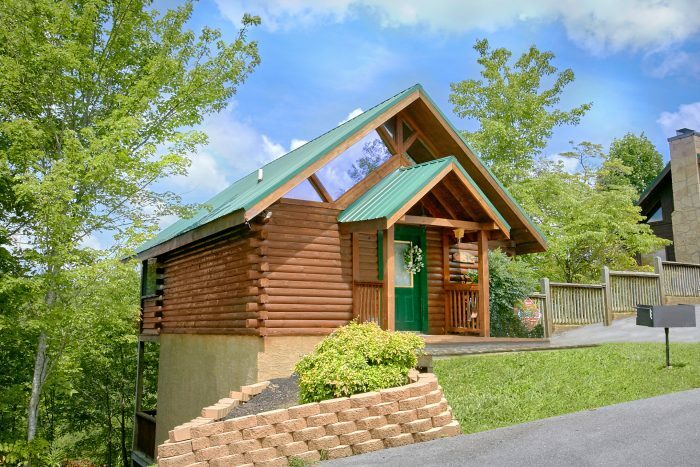 Save when you stay with Cabins USA Gatlinburg in the Great Smoky Mountains and Pigeon Forge!